Brought to you by MB Jewelry Shop and Shabby Chic Boho. I received a darling little Initial Cuff Bracelet -White Gold, from MB Jewelry Shop and I love wearing it and showing it off. I didn’t have an initial put on my bracelet but it is an option when you purchase the bracelet. It’s lovely and delicate and just so feminine. 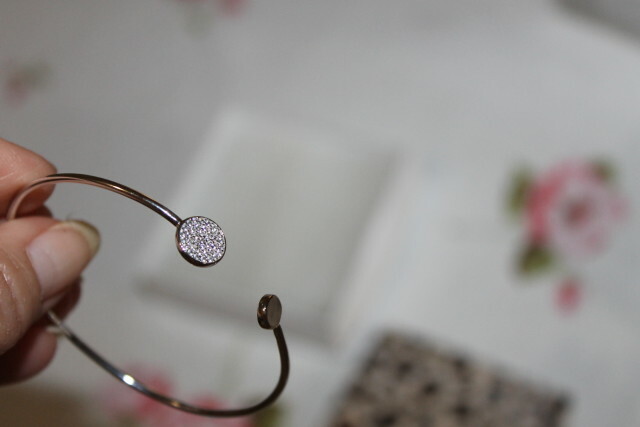 Things to note about the bracelet: Rhodium Plated, CZ Stones and it’s adjustable. Alyssa can wear it or I can wear it by adjusting the band. 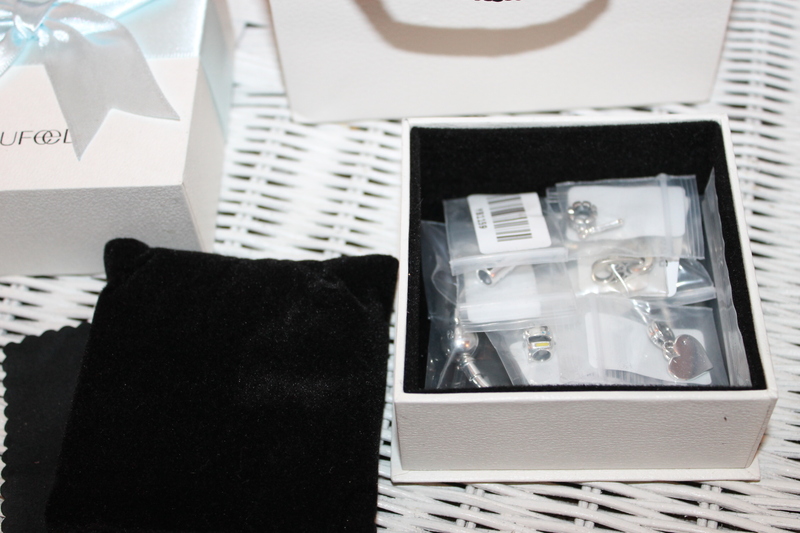 The bracelet arrived in a cute little box with the MB Jewelry Shop logo on it and inside was a jewelry pouch which the bracelet was in. I’ve been keeping it in the little pouch in my jewelry box. 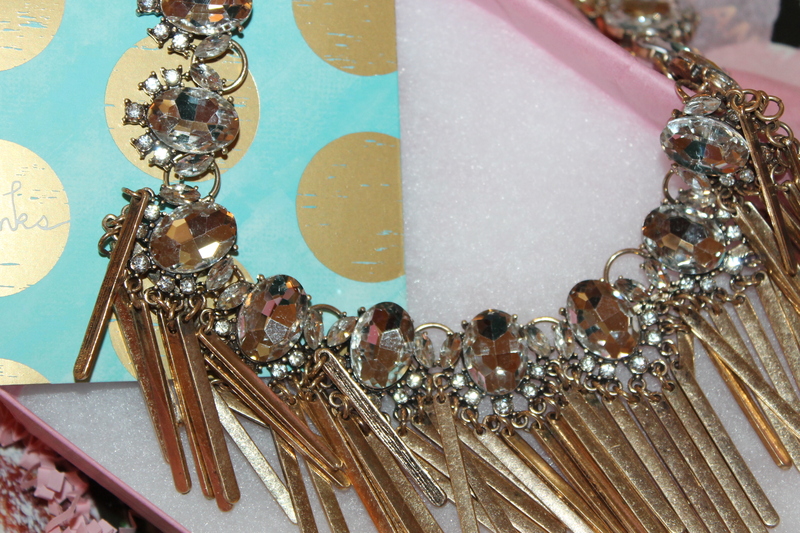 I think it adds a nice touch to the jewelry and it keeps my bracelet scratch free from my over crowded jewelry box. I’d love to have a dozen or more of these pouches to store my jewelry in. 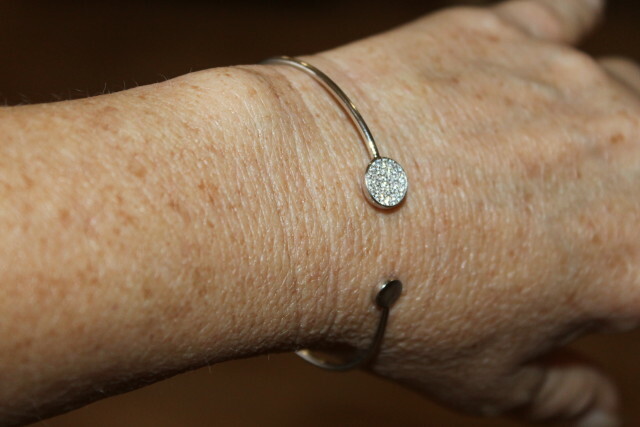 As you can see from my photos, on one side of the cuff bracelet, there is a plain side for your initial and on the other the CZ stones shine and sparkle. They look bright and beautiful when the light hits my bracelet. So far I haven’t had to do anything to keep my bracelet clean, it still appears to be new looking after wearing it several times. The band itself is a delicate band made of metal coated with white gold, that can be squeezed together to make it smaller or pulled apart to make it larger. I really don’t know what more I could say about this bracelet than it’s a stunning must have piece to add to your jewelry collection. 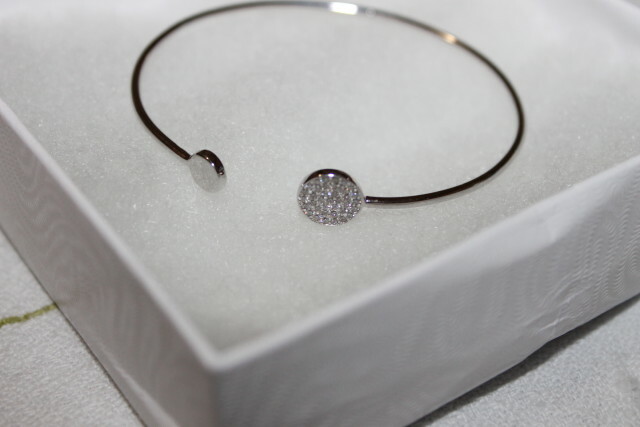 This particular bracelet currently sells for $125.00 which is very reasonable for the design. Another one of my favorite jewelry pieces from MB Jewelry Shop is the Double Butterfly Earrings. 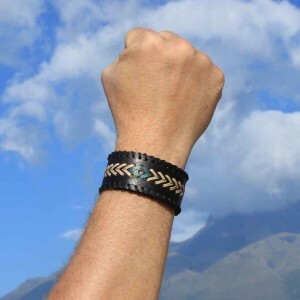 There is a matching cuff bracelet that can be purchased separately to match the earrings. 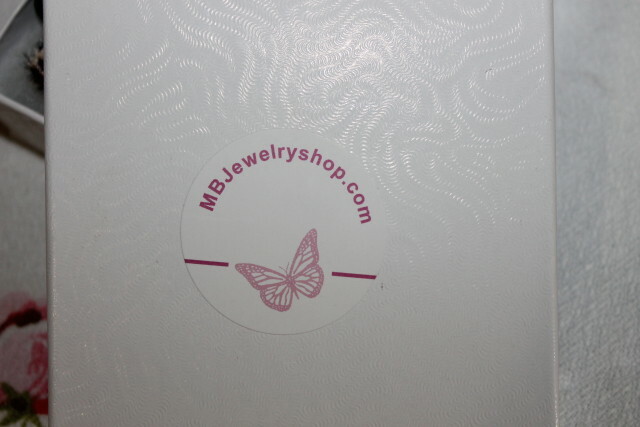 No matter what you decide to purchase from MB Jewelry Shop, I think you will be pleased with the jewelry. 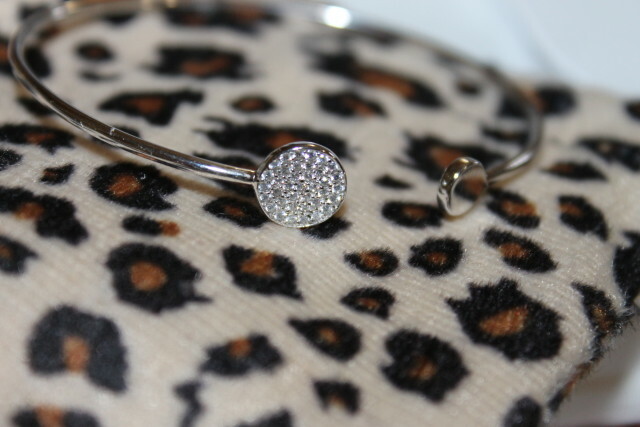 Would you purchase this Initial Cuff Bracelet for yourself or to give as a gift? 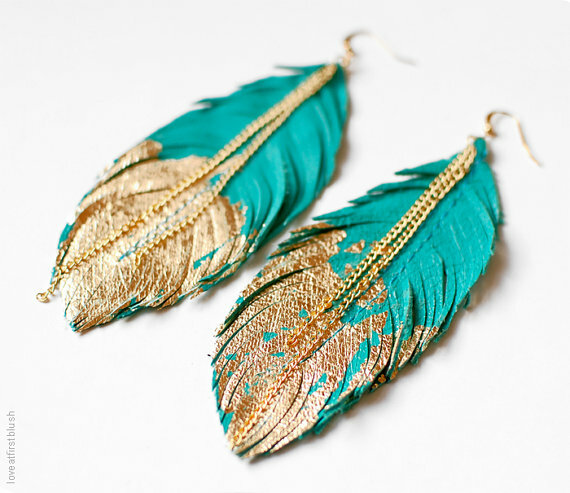 Head on over to MB Jewelry Shop and let me know which piece of jewelry you’d like to add to your jewelry collection. 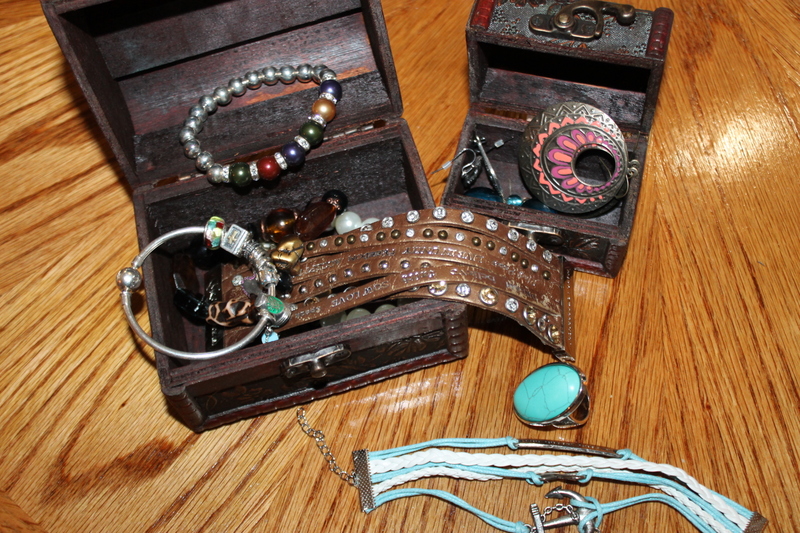 This post has been brought to you by MB Jewelry Shop and Shabby Chic Boho. I received the above mentioned product free for review purposes only. All opinions are 100% mine. I’m so glad you you like your initial cuff bracelet Terri! I’m giving everyone 10% off with coupon code Shabby10. This is a very pretty bracelet. I think my mom would like it for Christmas! This is absolutely gorgeous! Simple yet elegant. I think you could wear this with anything from jeans to a cocktail dress. Courtney recently posted…Dress of the summer. How pretty is that bracelet? So delicate and elegant! That bracelet is very cute. I love the simple design of it! Your bracelet is adorable. I want one. This would make me want to wear one too! that cuff bracelet is pretty I want one! And the jewelry pouch it came in is super cute! This is such a pretty bracelet! I’m going to have to browse through some of their earrings too. That jewelry pouch is so cute but it’s what inside that counts and that bracelet is beautiful! Love it! What a beautiful piece of jewelry. I so love the style, I so would wear this! Wow that is a gorgeous, and very elegant bracelet! I love it, I will have to check out MB Jewelry! So pretty. Very pretty bracelet. I love wearing bracelets – I think they make a outfit. I would definitely wear this bracelet. That is such a pretty cuff. I would totally wear this! That is such a cute bracelet. I would so wear this for sure. Very pretty — simple but lovely. And a cute bag to boot! I love how beautiful and delicate it is! I would absolutely wear this or give it as a gift. Beautiful I could so rock this one.